Deep-rooted summer active perennials kikuyu, chicory and panic survived three drought years at the EverGraze Proof Site in Wellstead, while summer-active tall fescue failed and lucerne declined over the same period. Kikuyu, chicory and panic persisted through three consecutive dry seasons. Lucerne persisted better on deep sand within the Proof Site compared to areas with shallow sand over gravel/clay. Summer-active tall fescue did not survive the first drought. Rotational grazing was critical to achieving good persistence in all perennials except kikuyu, which can be continuously grazed for extended periods. Traditionally livestock systems on the south coast of WA have been based on grazing annual pasture species like annual ryegrass and subterranean clover. In order to maintain livestock through summer and autumn producers rely on dry pasture residue and supplementary feeding of grain or conserved pasture. The downside to this type of feedbase is the decline in the quality of dry pasture residue, the cost of conserving pasture and its reliance on supplementary feed with its associated costs. The EverGraze Proof Site in Wellstead, demonstrated the benefits of including summer active perennials kikuyu, lucerne and chicory into existing grazing systems with the potential to extend the growing season and provide green feed in summer. 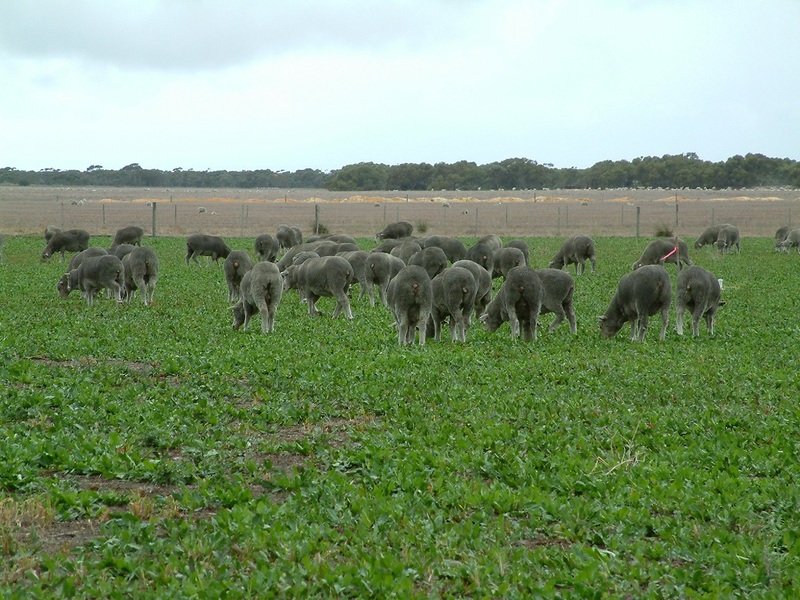 EverGraze research demonstrated production and profitability benefits from incorporating perennials into the system including increased gross margins, reduced supplementary feeding costs, increased weaner survival, the opportunity to finish lambs or flush ewes, and improved ewe condition pre joining. Variation in rainfall within years and between years can have a marked affect on perennial persistence, which is important both for meeting production potential and payback of the investment in perennials. 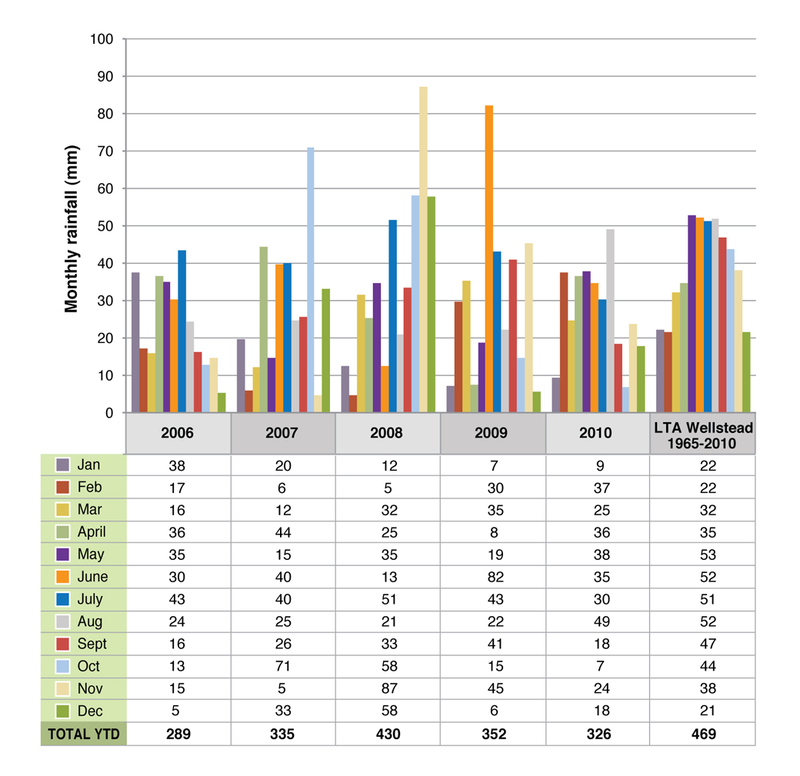 On the south coast of WA the years 2006 to 2008 were particularly dry and provided a good test for plant persistence. This page describes the persistence of the summer active perennials tested at the Proof Site from 2006 to 2010. The 60 ha EverGraze Proof site at Wellstead was planted to summer-active and temperate perennials in the spring of 2005. Species included lucerne, kikuyu, tall fescue, chicory, panic and setaria. Annuals were over-sown in the autumn of 2006 and subsequently 2007 due to poor establishment as a result of drought. Merino ewes mated to Poll Dorset sires were on the site from 2006 to 2008 with all progeny sold as store or prime lambs. Full details of the site can be found here. Along with key pasture and animal performance measurements, plant persistence was also recorded. This is a measure of the presence of a species as measured by contact of a plant base over 100 point grid covering one square metre area. The measurement is therefore expressed as a percentage, with each point of the grid representing one percent. Results are recorded as basal cover with measurements taken yearly in autumn following the break of the season. As an example a good perennial grass pasture may have a total basal cover of 5% for all species. In the case of kikuyu where the plant base is stoloniferous, basal cover is not an accurate form of measurement. Therefore plant frequency was assessed using the same 100 point grid. A score was recorded if kikuyu was present within the squares of the grid as opposed to the intersection of the squares as in the case of basal cover. A result of above 80% reflects good plant density. The EverGraze Proof Site at Wellstead has a Mediterranean climate with on average 29% of rainfall falling outside the growing season, which is typically from April to October. Mean annual rainfall for the period 1970 to 2010 was 467 mm. The first year of the demonstration (2006) turned out to be one of the driest years on record with the site receiving only 290 mm (Figure 1). Based on historical records (DAFWA) and SILO estimates, only one year since 1900 has been drier (2002 – which recorded just 264 mm). In the last 107 years, Wellstead has only recorded an annual rainfall of less than 350 mm on nine occasions which is approximately every one in 12 years. Unfortunately, the dry conditions continued into 2007 with February, March and May being particularly dry (Figure 1). The dry conditions, now seen as a drought, continued through the summer and autumn of 2008. Figure 1. Monthly rainfall at Wellstead (2006-2010) compared to the average recorded (1965-2010). Chicory and panic both increased in basal cover over the recording period due to the base of the plant increasing in size with maturity (Figure 2). Plant numbers per square metre was not recorded, however plant density in both of these swards remained high. 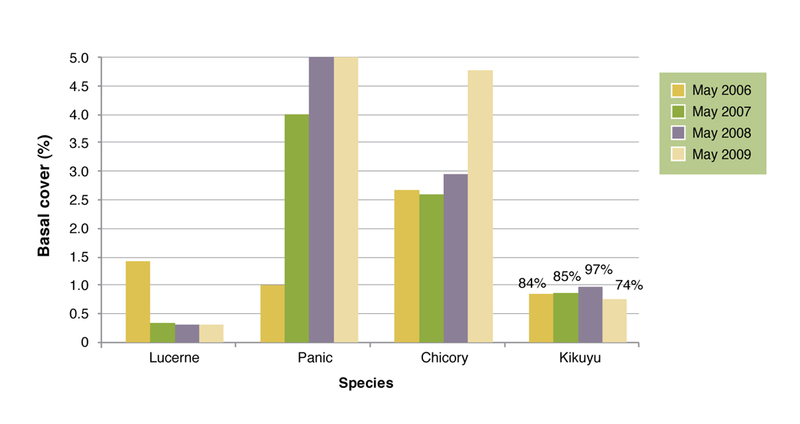 Figure 2 Basal cover (%) of lucerne, panic and chicory and kikuyu frequency at Wellstead Proof Site from 2006 to 2009. Kikuyu established quickly in the first summer due to favourable conditions and a high seeding rate. Over the four measurements, kikuyu maintained a high frequency which translated into good ground cover. This was maintained even under high stocking rates over the summer/autumn period. 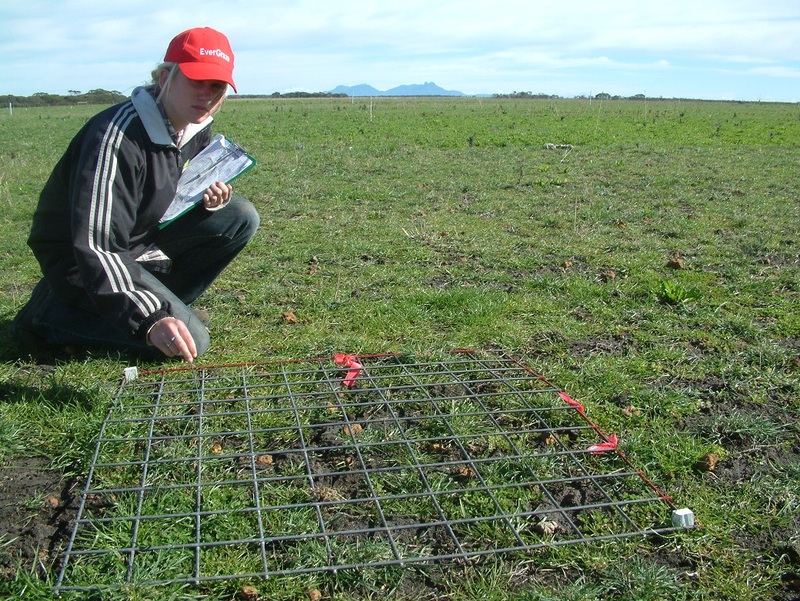 Lucerne performed poorly at the Proof Site due to the occurrence of shallow top soils (A horizon of 20cm) across a large proportion of the trial site. Lucerne requires a well drained, deep profile such as in deep sands or sandy duplex soils. At the Proof Site the sward contracted to an area of 2ha in which deep sand occurred. The plants that did establish declined in number over the remaining three seasons, with wingless grasshoppers, locusts in 2007 and kangaroos taking a toll on the plant density. The summer active tall fescue was planted on a similar soil type as lucerne resulting in an excellent establishment in spring 2005. The basal score was 3.5 in May 2006, which was higher than any other perennial species. But with the record dry season of 2006 and a dry summer in 2007 the population had all but disappeared by May 2007. With this knowledge, summer active tall fescue cannot be recommended as a viable option for this environment. 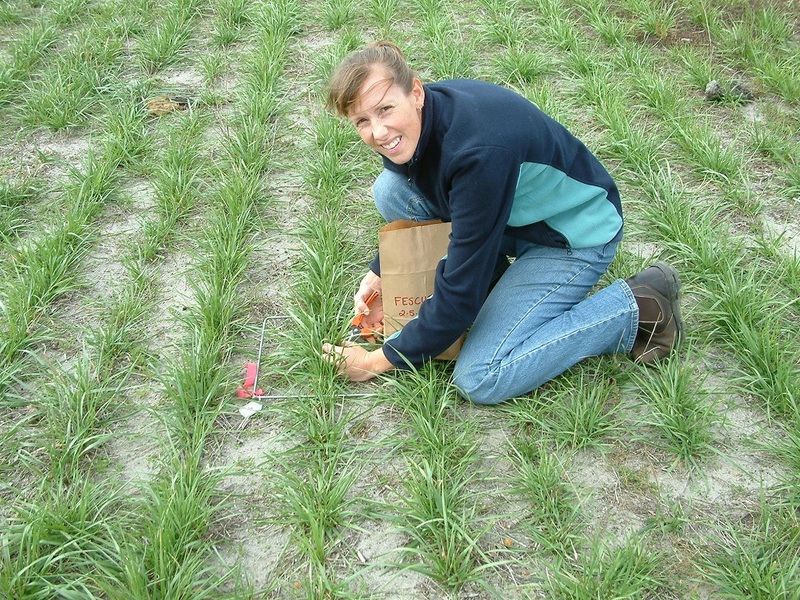 Paula Jacobsson taking a pasture cut in the newly established tall fescue pasture at the Proof Site in May 2006. 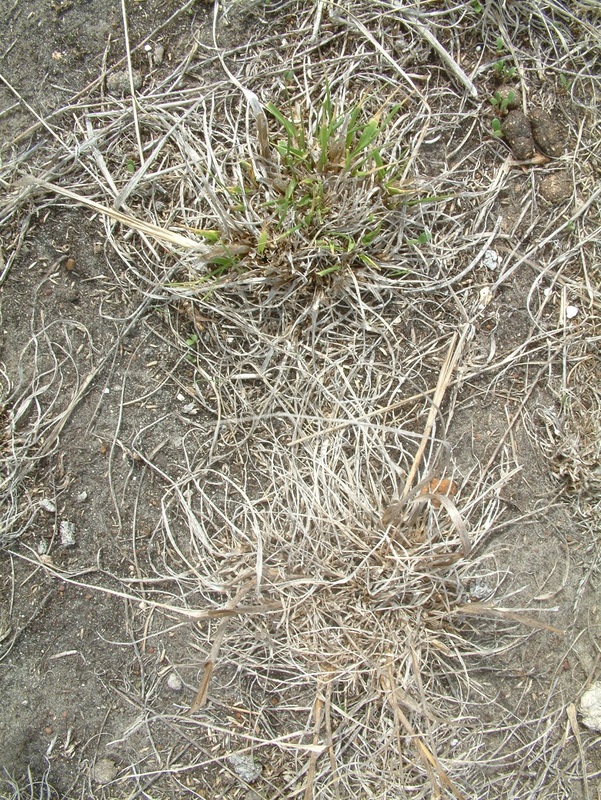 The impact of the drought on plant survival – the closest plant has not survived the summer and the other is doing poorly. This photo was taken in April 2007 following the break. The data clearly shows that kikuyu, chicory and panic are persistent in the Proof Site environment as measured by the increase in basal cover in chicory and panic and an increase in groundcover in kikuyu. It is important however to consider why this may have been the case. The rainfall was well below average for the four years of the trial which favoured the more drought tolerant species. However future seasons are expected to be drier and drought years more frequent. With all this in mind, it is important to consider the right plant for the right place (soils and climate) and the right management to achieve persistence of perennials. As a rule of thumb, perennials should not be set stocked. Kikuyu is the only exception to this rule as it has rhizomes below the soil surface which are not affected by grazing and therefore the plant maintains a large number of growing points per unit area. The alternative to set stocking is some form of rotational grazing. The concept of rotational grazing is to have a set grazing and rest period for each paddock based on pasture availability and stocking rate. The advantage of this is that it allows management of residual pasture or leaf area as this has a bearing on the plants ability to regrow i.e. ‘leaf grows more leaf’. Conversely, feed quality declines with maturity, so rest periods can be matched with biomass production. 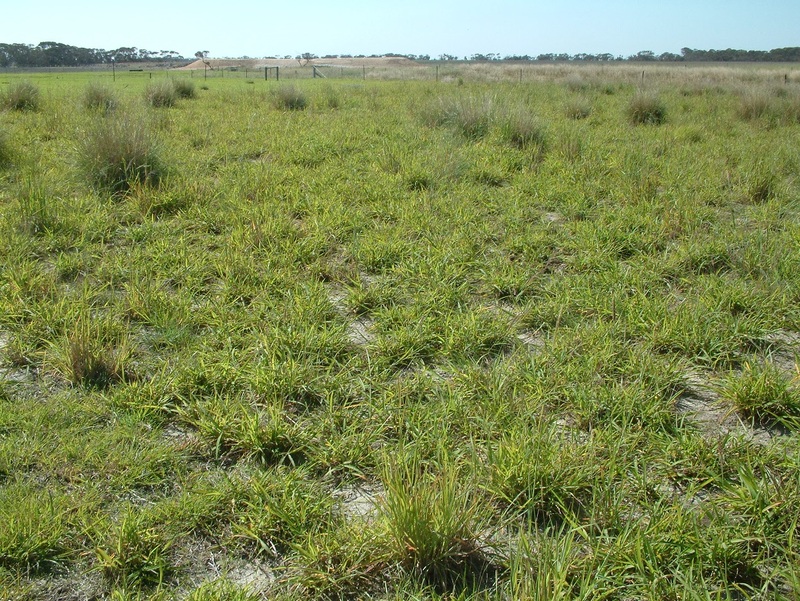 The key to long-term persistence of perennial pastures is to manage the carbohydrate reserves. Perennial plants store carbohydrate in their crown, tap-root, stolons and or rhizomes and use this energy for the initial regrowth following defoliation. If carbohydrate reserves are continually exhausted and not fully replenished, then the stand densities will gradually decline. Full details on grazing management of perennials can be found under EverGraze On-Farm Options for further information on grazing management. Matching the right plant to the right climate and soil type is critical for achieving persistence. South-western Australia has a Mediterranean climate with a strong winter dominant rainfall pattern and is suited to annual pastures. In contrast the perennials that persisted at the Proof Site were summer-active and grow mainly outside the winter and early spring period. The important climatic features for these species are warm spring temperatures and out of season rainfall. Perennials have an advantage over annuals in two particular times of the year. Early autumn rain: triggers perennial plant growth, annuals under the same conditions can suffer from false breaks and seed bank decline. Late rains in spring and early summer allow perennials to grow actively under warm conditions after annual pastures have senesced. In general, perennial pastures are poorly adapted to shallow soils because of the limited soil volume for the roots to explore. 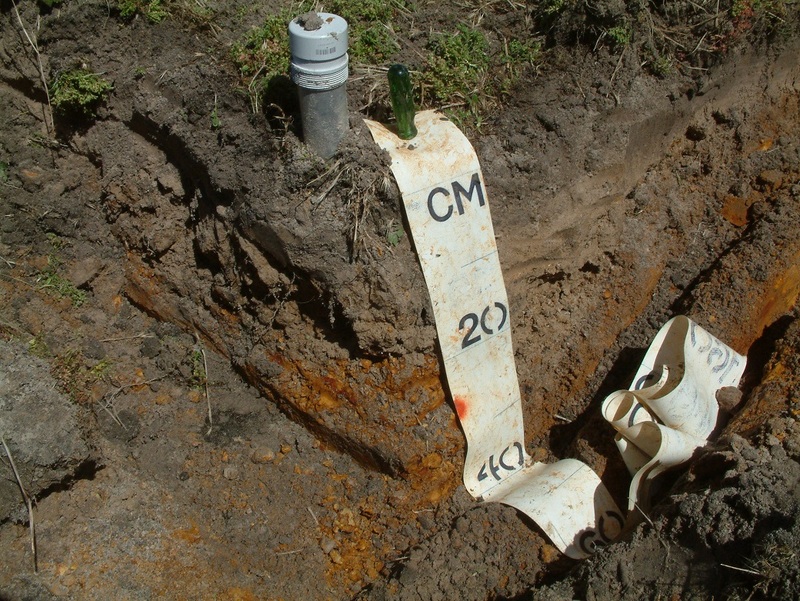 The most suitable soils for growing perennial pastures are deep soils and those where the soil moisture extends into late spring to early summer. 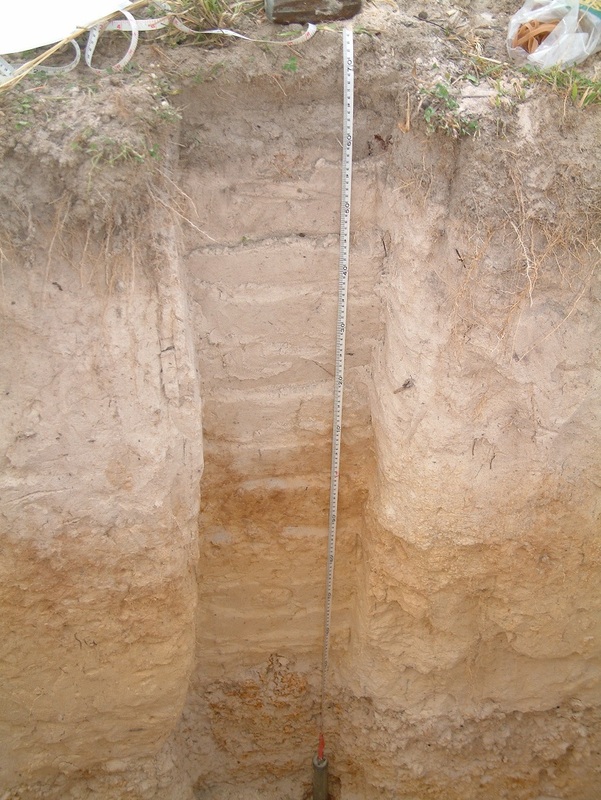 See the Albany Proof Site soils page for further information on the soils match to pasture species at Wellstead. 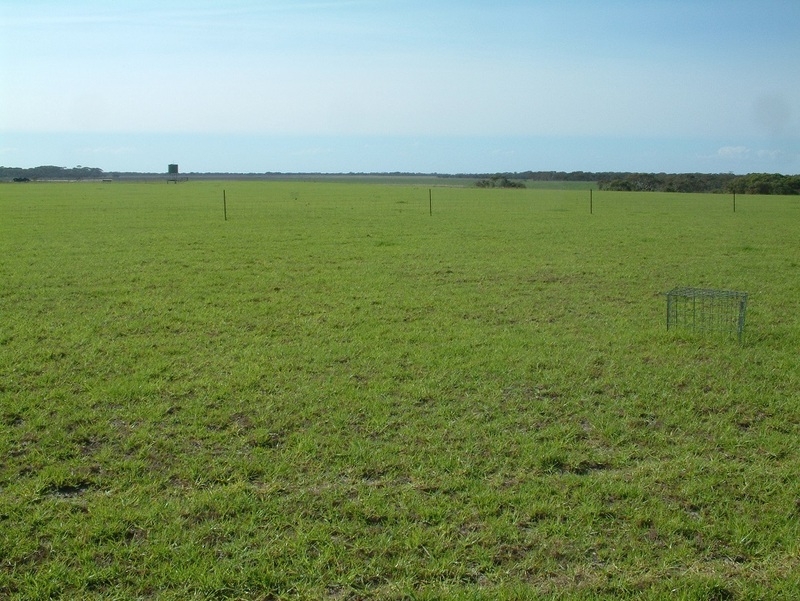 The persistence of perennial pasture swards is key contributor to profitability. Perennial swards will generally cost upwards of $110/ha to establish. If the pasture fails then the cost of re-establishment will greatly increase the payback period. The cost of establishment varies for different perennial species and economies of scale. For example it is estimated that the cost of establishing kikuyu at 1 kg/ha is between $110 – $190/ ha based on the assumptions in Table 1. Table 1. Costs associated with establishing kikuyu at 1 kg/ha. It is important to remember that establishment costs should be annualised over the life of the perennial sward. For lucerne and chicory this could be five years, whilst a permanent kikuyu sward could be annualised over 30 years. Also note that lost grazing time to the paddock during establishment (usually around six months), and the cost of any additional fertiliser above normal maintenance requirements have not been considered in these costs. The persistence of perennial swards is a critical factor in the uptake and profitability of perennial farming systems in WA. Establishment costs can be considerable and this combined with the impact of lost production can result in increased payback periods. For most perennial species it is critical to initially establish high plant numbers per unit area. If this is not achieved then the production and persistence of the sward will be compromised. This requires sowing at the right time, good weed control, insect control, correct seeding depth, application of appropriate fertilisers and ameliorants and the use of the right seeding equipment. Achieving persistence of perennial swards can be distilled into a few key points. Choose the right plant for the soils, climate and purpose. Get the establishment package right. Manage the sward for livestock production and perennial persistence. EverGraze is a Future Farm Industries CRC research and delivery partnership. The Albany EverGraze Proof Site team was lead by Paul Sanford and consisted of other scientists and technical staff at the Department of Agriculture and Food Western Australia. An enthusiastic Regional Advisory Group consisting of farmers, consultants, extension officers, Landmark and South Coast NRM staff provided significant input into the direction, management practices and interpretation of outcomes from the experiment and modelling to make them relevant to farmers. Eric Dobbe, Department of Agriculture and Food Western Australia, Albany. Paul Sanford, Department of Agriculture and Food Western Australia, Albany. Ronald Master, Department of Agriculture and Food Western Australia, Albany.